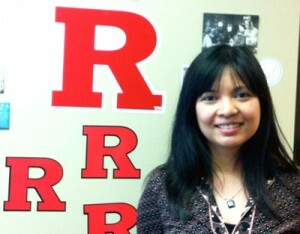 Posted May 23, 2012, in We R Arts and Sciences Student Spotlight. I joined the Rutgers-Camden community in 2007, as part of the inaugural class of childhood studies doctoral students. I was a little nervous about being part of a new program that didn’t have an established history. But I was also excited by the unique opportunity to help create this history for our fledgling program and take an active role in shaping the emerging field of childhood studies. I’ve accomplished so much as a Rutgers graduate student. My achievements, however, have everything to do with the fact that I am part of an institution that has a strong and proud tradition of supporting graduate student work, that has the infrastructure to provide students financial and academic resources. I was able to focus on presenting and publishing my research and creative work during my first two years because I was supported by a Rutgers Presidential Fellowship. I also received multiple conference travel grants from the Faculty of Arts and Sciences and the Department of Childhood Studies. The Resource Center for Graduate Student External Support, which is based in New Brunswick, helped me craft a successful application for a competitive fellowship offered by the Library of Congress. My professor and dissertation adviser, Dr. Lynne Vallone, guided me as I wrote a paper that eventually received an award from the Children’s Literature Association. My perception of Rutgers, however, is shaped largely by my experiences in my first semester at Rutgers. In November 2007, my mother, who lived in the Philippines, passed away unexpectedly. I missed the rest of the semester, as I had to fly back home. I thought then that my academic career had ended. But while I was concerned about deadlines and remaining academically competitive, my professors and colleagues respected my need to mourn and reminded me to focus on my family. When I returned to Rutgers-Camden in Spring 2008, faculty, staff and fellow students rallied around me, and that was when I truly fell in love with Rutgers-Camden. I came to understand it as an institution that values ambition and academic excellence alongside compassion and a sense of community. Page last updated by Faculty of Arts and Sciences at 1:04 pm August 8, 2013 . This page was printed from http://fas.camden.rutgers.edu/2012/05/23/lara-saguisag/ at 1:05 AM Wednesday, April 24, 2019.